The Volcanoes of Japan, Part 1, Fujisan, Yokohama, Kelly & Walsh, Yokohama, Shanghai, Hongkong and Singapore, printed at the Tokyo Tsukiji Type Foundry, collotypes by K. Ogawa, horizontal large 4to (11 1/4 x 15 1/2 in - 28.8 x 39.5 cm), undated but ca 1892, no colophon, pale green card covers, staple bound with spine left uncovered, 10 tissue guard protected black and white collotype plates, 32 pp. Dating the Publication. The title page does have a date. However, the preface refers to proposed part to follow which will contain photographs to be taken "...during the Summer of 1892." 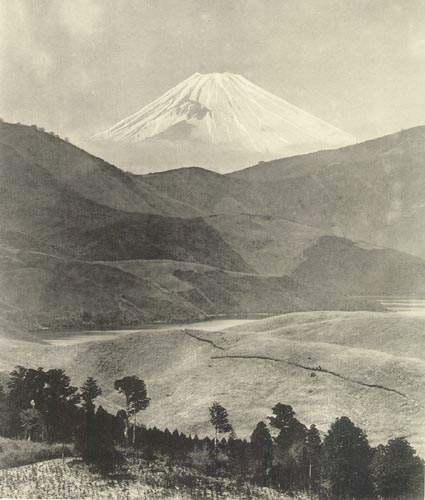 The preface also refers to a K. Ogawa photograph (Plate III) which won an award in 1890. Based upon this information, I have placed the date at ca. 1892. Wenckstern records the book as "no date, 1892." This is one of the earliest finely illustrated Western language books I am aware of which deals exclusive with Mount Fuji. The book is unique because of a confluence of several aspects. Level of Competence and Expertise of the Authors. John Milne was a world renowned geologist and seismologist. W.K. Burton was a noted engineer and recognized expert in the technical aspects of photography. 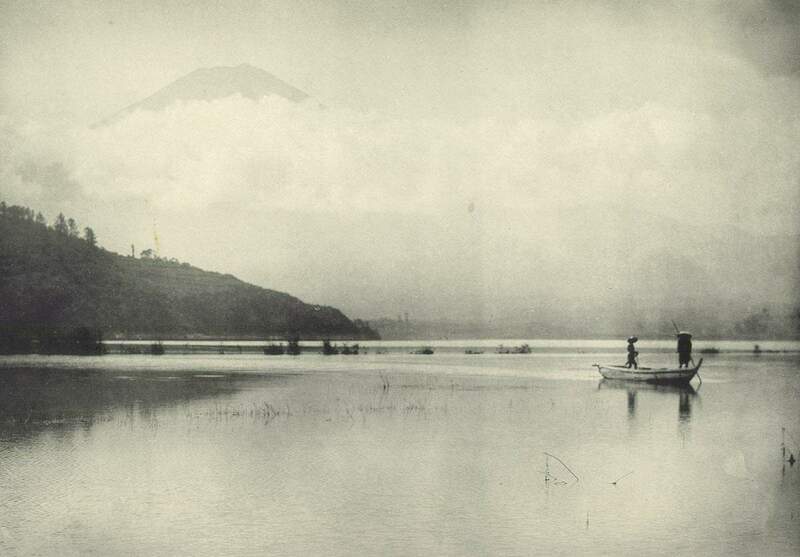 Competence in Photography, Collotype Plates and Printing. W.K. Burton was also a widely respected and very active photographer in Japan. K. Ogawa was one of Japan's leading professional photographers and a pioneer in the collotype printing process in that country. 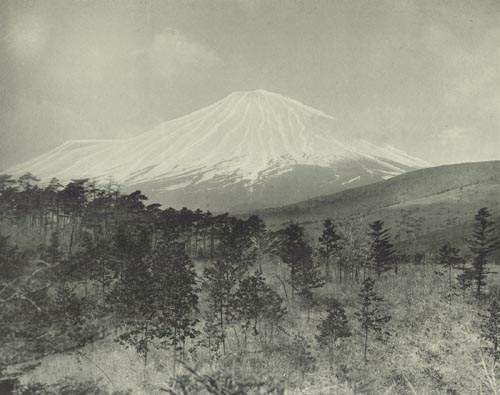 At least one of the plates was rendered from an award winning K. Ogawa photograph and all the plates were prepared for collotype printing by his firm. The book was printed at the Tokyo Tsukiji Type Foundry which was a state of the art printing facility . Subject Matter. 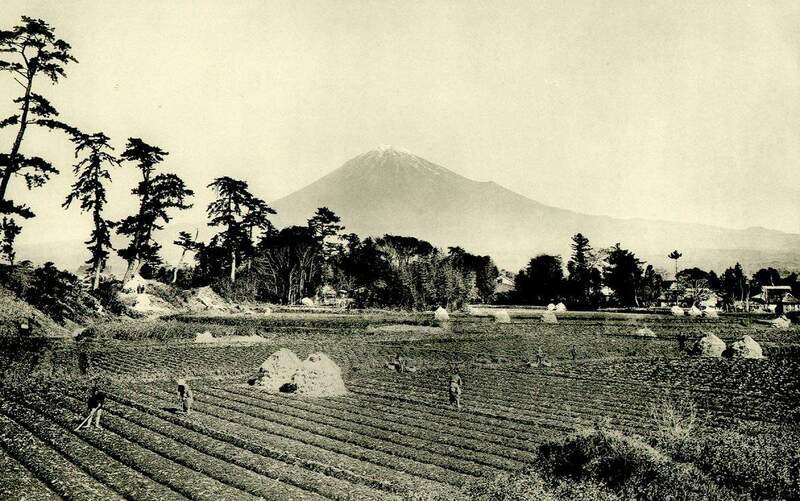 Mount Fuji is probably the most widely recognized icon of Japan. Condition. The book has medium thickness flexible cardboard type covers. They were merely glued (ca 1/2 inch affixed) at the spine over the text block which is secured by staples. The book is in a horizontal format. As the pages were turned they would put considerable pressure on the front card cover creating a crease immediately forward of the area where it is affixed. Continued opening of the book would weaken this crease and often it would break or even completely separate the front cover. It is my experience with this book that the front cover is generally badly severed or missing completely. Collation. 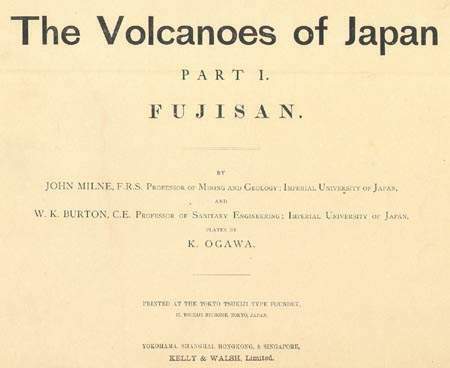 Title Page, Contents, Preface (i-ii), Introduction (text - pages 1-2), "Fujisan" (text - pages 3-12), followed by 10 black and white collotype plates. Each plate is preceded by a one (Plates 2-10) or a two (Plate 1 only) page text discussion. Text pages printed front and back. Collotypes printed on the front. The last printed page with a page number is page 14 at the conclusion of the discussion of Plate I. Not counting the Title, Preface and Contents pages, there are 32 pages of text and plates. 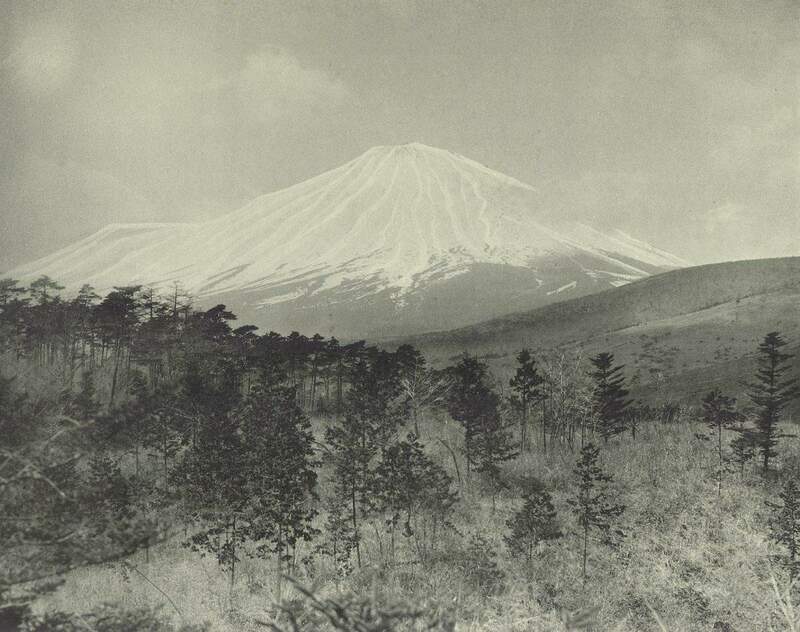 John Milne (1850-1913), a British geologist, arrived in Japan in 1875 and became a Professor of Geology and Mining at the Imperial University of Japan, Tokyo in 1877. The earthquake of February 22, 1880 in Japan was a turning point in his professional life and he became more of a seismologist than geologist. 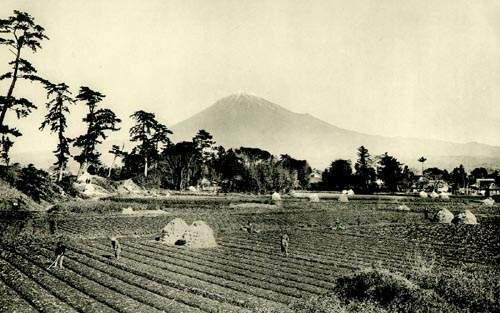 In 1880 he was a founding member of the Seismological Society of Japan (Vice President) which published the first Transactions of the Seismological Society of Japan covering the period from April-June of 1880. He was a major contributor to the published proceedings of the society. Milne has the distinction of being considered one of the founding fathers of modern seismology and the inventor of the modern seismograph capable of continuous recording. 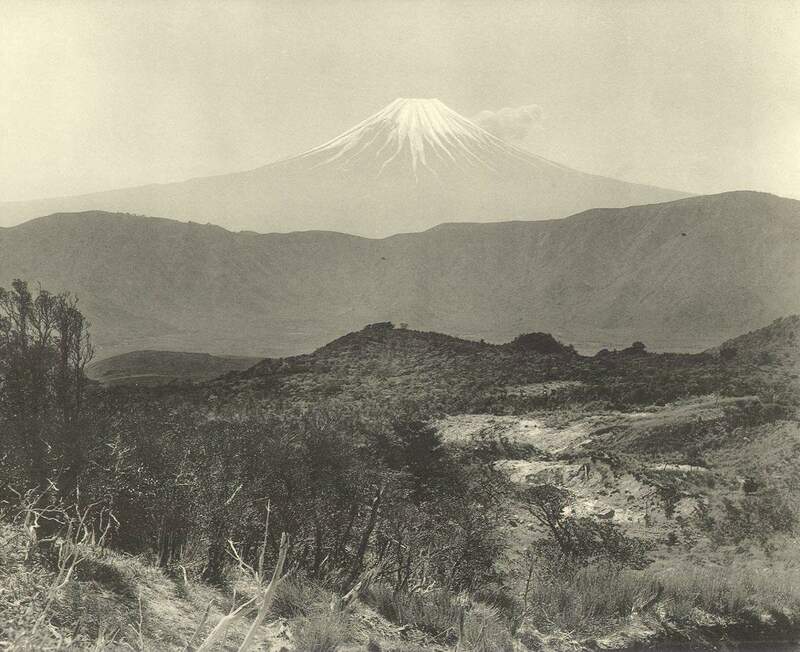 Milne had a particular interest in the relationship of earthquakes and volcanoes. He eventually concluded that earthquakes were not caused by volcanoes but rather they were primarily the result of a build up of energy in rocks caused by deformation of the earth's crust. Milne's interests also extended into the history of Japan as revealed in the archaeology evidence. He was a friend of the American zoologist Edward Sylvester Morse although his opinions on stone age Japan differed considerably from those of Morse. In February of 1895 an earthquake destroyed most of Milne's instruments, books and possessions. Disheartened by this situation, he left Japan after a 20 year stay and returned to England where lived on the Isle of Wright. 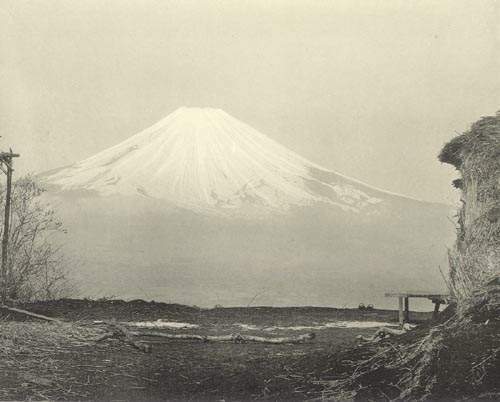 While in Japan, Milne co-authored The Great Earthquake of Japan, 1891 (1892) and The Volcanoes of Japan, Part 1, Fuji-san (ca 1892) (both J. Milne, W.K. Burton, K. Ogawa plates, printed by the Tokyo Tsukiji Type Foundry). While in England, he co-authored an important textbook on earthquakes with W.K. 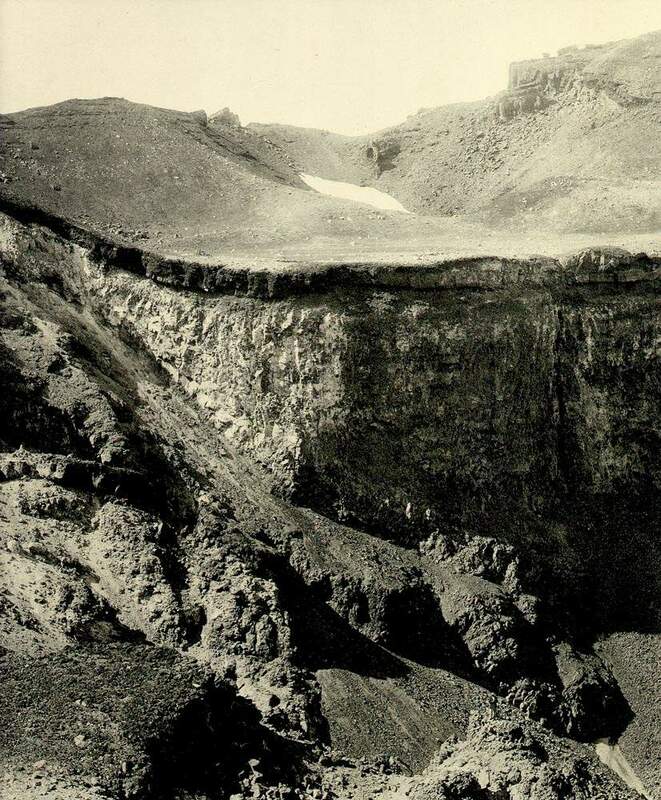 Burton (Earthquakes and Other Earth Movements, 1898). 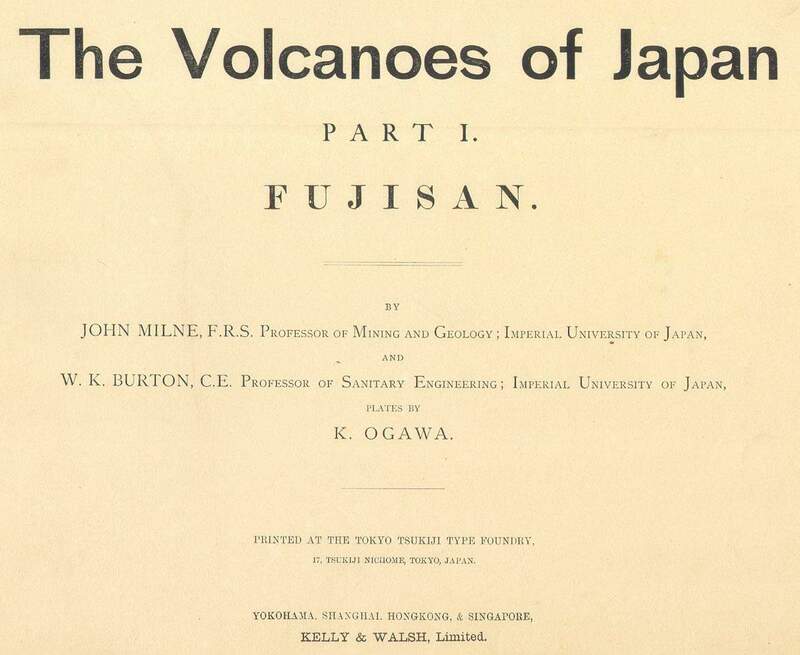 Milne also published many scholarly works on seismology while in Japan and is best remembered for his works on earthquakes, volcanoes and tsunamis. In Wenckenstern one finds numerous entries relating to Milne's publications as a geologist/seismologist. William Kinninmond Burton (1856-1899), a Scottish engineer, arrived in Japan in 1887 and immediately became a Professor of Sanitary Engineering at Imperial University of Japan, Tokyo. He helped design the water and sewage systems that would take Tokyo and other Japanese cities into the 20th century. He designed the Ryounkaku which is considered to be the first Japanese sky scraper. This 12 story, 220 foot tall, building in Asakusa was the tallest building in Tokyo at the time it opened in 1890. Burton was an avid photographer and noted expert in the technical aspects of photography. He published several technical works on photography. Burton had a close association with Kazumasa Ogawa, the noted Japanese photographer and collotype printer. Along with Kazumasa Ogawa, Burton was a founding member of the Japan Photographic Society (Nihon Shashinkai), Japan's first organization for amateur photographers. Burton left Japan in 1896 and went to Taiwan but returned in 1899 where he died at the age of 43. 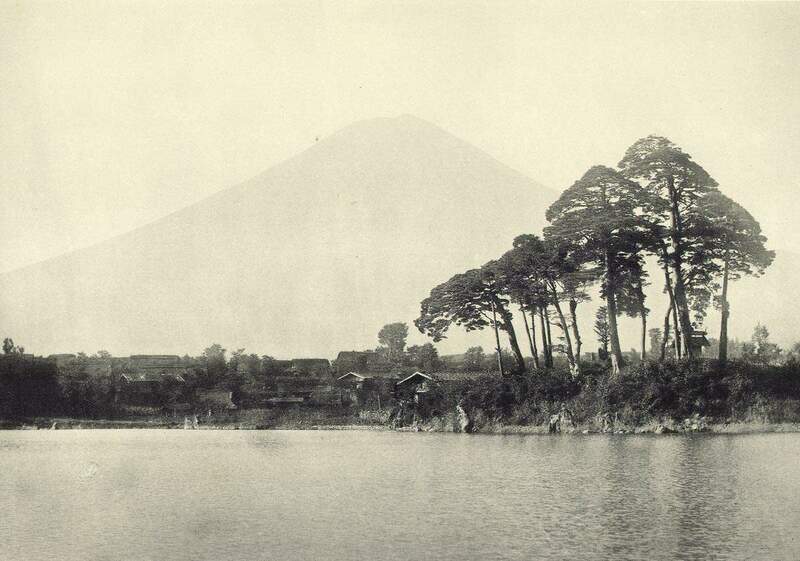 1892, K. Ogawa, Kusakabe Kimbei, W. K. Burton & James Murdoch,The Hakone District, Illustrated by K. Ogawa, Photographer, in Collotype With Descriptive Text by James Murdoch, M.A., Tokyo, K. Ogawa, Meiji 25 (1892), folio (12 x 16 in - 30.2 x 40.5 cm), decorated card covers, spine covered with cloth, string ties, 1 map in color (chromolithograph), 17 collotype plates with a total of 26 different images. Three plates have 4 images and 14 plates have a single image. For more information on this book, click here. 1892, Sights and Scenes on the Tokaido, Tokyo, K. Ogawa, Folio, 1 page preface, 4 pages of introduction, 20 black and white collotype plates, 22 pages of descriptive text, total of 47 pp. The 20 black and white collotype plates contain a total of 44 images. Twelve plates have a single image and 8 plates have 4 images each. Each page is protected by a tissue guard giving the plate number. There is no descriptive text on the plate or tissue guard. The images are based upon photographs by Kazumasa Ogawa, Kusakabe Kimbei, Adolfo Farsari and William K. Burton. Each plate is preceded by a one to two page description of the significance of the image that follows. 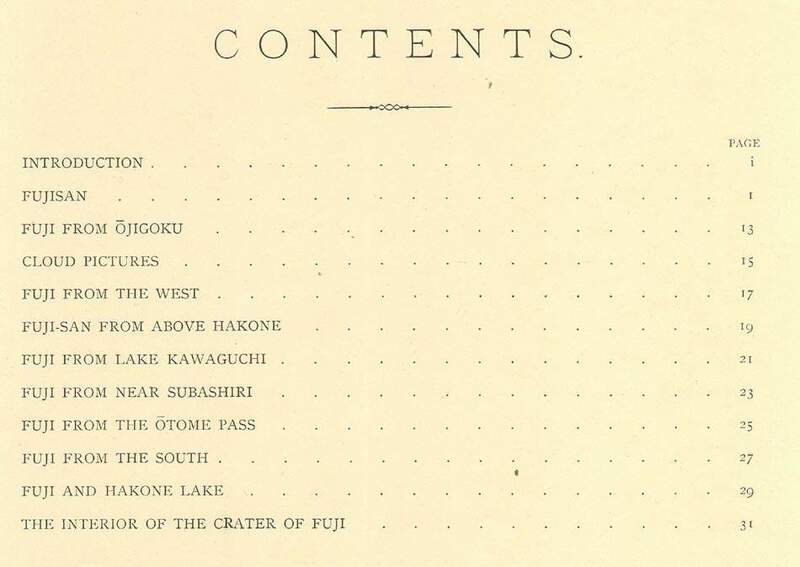 Contains a colophon dating the book to Meiji 25 (1892). Also sold in painted wooden box. For more information on this book, click here. ca 1892, John Milne and W.K. Burton, The Volcanoes of Japan, Part 1, Fujisan, Yokohama, Kelly & Walsh, Yokohama, Shanghai, Hongkong and Singapore, printed at the Tokyo Tsukiji Type Foundry, collotypes by K. Ogawa, horizontal large 4to (11 1/4 x 15 1/2 in - 28.8 x 39.5 cm), undated but ca 1892, no colophon, pale green card covers, staple bound with spine uncovered, 10 tissue guard protected black and white collotype plates, 32 pp. For more information on this book, click here. ca 1892, W. K. Burton and John Milne, The Great Earthquake of Japan, 1891, Yokohama, Lane, Crawford & Co., printed at the Tokyo Tsukiji Type Foundry, 1st edition, green cloth with gilt lettering, oblong 4to (29 x 41 cm), green cloth with gilt, 30 black and white K. Ogawa plates and a lithographic map, plates protected tissue guards with descriptive titles, 71 pages indicated in the table of contents. ca 1893, W. K. Burton and John Milne, The Great Earthquake of Japan, 1891, Yokohama, Lane, Crawford & Co., printed at the Tokyo Tsukiji Type Foundry, 2nd edition, green cloth with gilt lettering, oblong 4to (29 x 41 cm), green cloth with gilt, 29 black and white K. Ogawa plates and a lithographic map, plates protected tissue guards with descriptive titles, 70 pp. For more information on this book, click here. ca 1893, W. K. Burton (photographs), J. Murdoch (text), K. Ogawa (plates), Scenes from Open Air Life in Japan, Photographed by W. K. Burton, Plates by K. Ogawa, Text by J. Murdoch, large 4to (11 x 15 1/2 in - 28.2 x 39 cm), color woodblock illustrated stiff covers with silk covered spine, two multi-color silk ties (blue, red and white) which each pass through four holes, gold illustrations inside the front and back covers, introduction (1 unnumbered page), 18 number pages of letterpress text, 14 black and white collotype plates with descriptive captions printed below the image. Undated but listed in the library (catalogued July 31, 1893) of the Japan Society, London, Transactions and Proceedings, Volume I, 1893. Also dated to 1893 by Wenckstern. For more information on this book, click here. ca 1893, J. Murdoch and W.K. Burton, Out-Door Life in Japan, Yokohama, photographs by W.K. Burton, text by J. Murdoch, printed by K. Ogawa, 8vo, 2 photographs per page, 25 pp. Undated but listed in the library (catalogued July 31, 1893) of the Japan Society, London, Transactions and Proceedings, Volume I, 1893. 1895, W. K. Burton, Wrestlers and Wrestling in Japan with an Historical and Descriptive Account by J. Inouye, 1895, 4to, 12 collotype plates by K. Ogawa, 18 pp. Reported with black and white collotypes and with colored collotypes. 1892, W. K. Burton, Practical Guide to Photographic and Photo-Mechanical Printing. Second Edition, Revised and Enlarged, London, Marion & Co, printed by R.R. Clark, Edinburgh, large 12mo, red cloth with black decoration and lettering on front cover and spine, numerous text illustrations, 415 pp + 46 pp of illustrated ads for Marion & Co products. An important handbook including an historical sketch of photographic printing processes and photo-mechanical printing processes. The book contains extensive and technical sections on silver printing, platinotype process, printing with salts of uranium, contact printing, mounting of prints, carbon processes, a wide variety of modern photo-mechanical printing processes (Woodbury, Stannotype, photo-lithography, collotype process, halftone processes). The book offers an important insight into the types of printing work being performed in Japan by K. Ogawa at this point in time. 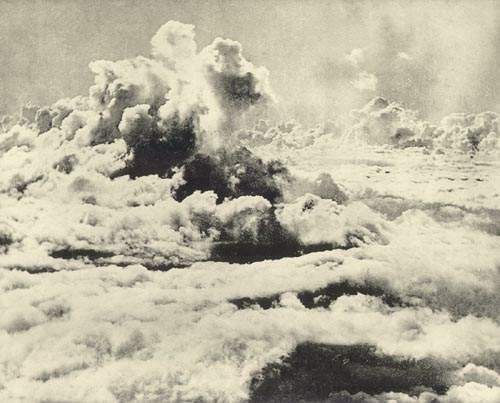 When living in England, W. K. Burton was also the author of an earlier publication on photography, The A.B.C. of (Modern) Photography, London, Piper & Carter, 4th edition, 1884, a 124 page booklet which is described as "a manual of photography for beginners on the assumption that the gelatine process is now the process of the day." 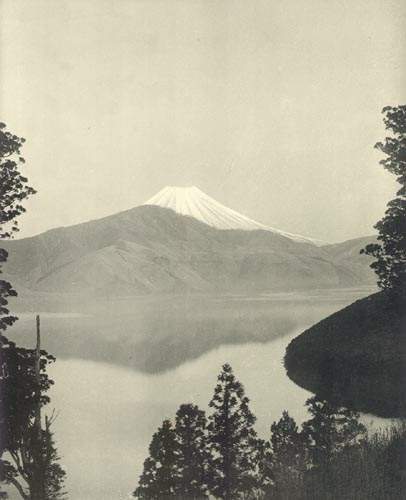 In an edition of this book published ca 1887 Burton, comments on the gallery of A. Farsari and Co. in Yokohama and the colorization of photographs done in there. For more information on the 1892 guide, click here.